Concrete is everywhere: below your basement carpeting, making up the foundation of your house or office building, under the roads and bridges you drive on, and in the sidewalks and stoops lining your neighborhood. Concrete is everywhere, but – unless you have a background in engineering or construction – you probably don’t know much about it. That’s why embarking on any concrete repair project can be intimidating. You want to make sure the work gets done right, and at a fair cost to you. But you’re not sure who you can trust, how repairs will be done, and what you can expect during the repair process. Here at Liftech, we want our customers to know what they can expect. We do our best to anticipate and answer their questions so that they can feel confident about moving forward. In that spirit, welcome to our “what to expect” blog series. In this series, we’ll post periodic blogs giving a layman’s perspective of what you can expect from the various types of concrete repair work we do, answering all the relevant questions we can think of. Have a question we didn’t cover? Let us know! How Do I Find Out If You Can Fix It? A qualified Liftech representative will come to your site, survey the lifting or leveling repair needed, and let you know if we can help. We are honest and transparent, and we’ll let you know right away if we assess that our solution won’t work for your needs. Fortunately, in the majority of concrete lifting and leveling situations, our solution works well. You can schedule your free, no-obligation onsite estimate by filling out a simple form on our website or giving us a call at (888) 267-1153. We will quote specific pricing for your concrete lifting or leveling repair during your onsite estimate. Variables such as the amount of failure, total area of concrete, overall complexity of the repair, and accessibility to the job site will impact how long a project will take, how much material will be used, and how much it will ultimately cost. That said, typical pricing for using our polyurethane foam injection technology to lift or level concrete comes in at half or less than half of the cost of concrete replacement, and certainly a fraction of the hassle. In other words, yes, this type of advanced technology comes with a price tag. Sometimes, we are 25% or more higher than the price of mudjacking – but, as with everything in life, you get what you pay for. (To learn more, please see the response below on “How Long Will My Repair Last?”) After weighing all options and doing their homework, the vast majority of customers still choose our technology over mudjacking, unless they are looking for the cheapest “band-aid” fix. Most customers are very pleasantly surprised at our pricing: As of 2017, our average repair was just over $1,700. Jamie drills a hole while Kody removes a port. When Will I Pay You? For concrete lifting and leveling work, we do not require a down payment. You don’t pay us until we have completed the repair to your satisfaction. Once your repair is finished and you are happy with it, you may provide your Liftech Lead Technician with the amount due in the form of cash, a check, or a credit card payment. Note that we do provide a discount for cash or check payments. Strategically drill several penny-sized (⅝”) holes at the site of the repair. Placement of the holes depends on the nature of the leveling or lifting required. As we drill the holes, we use special vacuums that surround the drill bit, keeping dust to a minimum. Install specially designed, reusable ports into each of the drill holes. The ports enable us to inject the mixture that creates the foam to the necessary depth. Attach our carefully calibrated gun to each port to securely inject a two-part polyurethane mixture. Once injected below the concrete, the two components mix to create a foam that expands to create the lifting or filling effect. Closely monitor our progress in achieving the lift or leveling needed, watching, listening, feeling, and measuring to assess our progress. 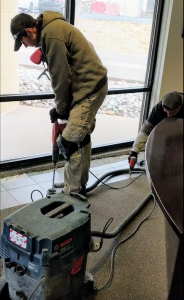 Occasionally, a small amount of foam may escape at the edges of the concrete; in that case, our technicians quickly use their tools to remove it. Fill all holes with high-density cementitious grout. We do our best to match the existing concrete so that you can hardly tell a repair has been made. Clean up the repair site. We remove all trash and sweep up all our dust, making our best effort to return the site to its original condition. Await your inspection. The job isn’t done until it’s done to your satisfaction. Liftech’s lifting and leveling repairs are completed with systems utilizing North Carolina Foam, Inc. (NCFI), the first and only company to develop a chemically stable polymer specifically formulated for geotechnical applications. NCFI has been in use for more than 20 years, and Liftech is one of only three companies in the state of Colorado certified and authorized to use these systems. It’s important to understand that not all foams are created equal. Unfortunately, many other Colorado companies using foam to repair concrete do not use systems designed for geotechnical use, which means those foams are susceptible to failure. Is the Foam Safe for the Environment? All NCFI polymer-resin materials are environmentally benign and have no detrimental effect to ground soils as a result of decomposition or degradation of the polymer. Jamie injects poly as Jonathan cleans up. NCFI’s polymer contributes to the LEED point system, since material components used in NCFI’s 24-010 and 24-486 polymers use materials that are rapidly renewable. Will It Look as Perfect as Newly Poured Concrete? It will look very, very good – but if you require absolute perfection from your solution, you may want to consider re-pouring your concrete. Customers love Liftech’s lifting and leveling solution because it provides a balance of convenience, quality, reliability, and cost savings. Check out what some of our highly satisfied customers have to say on Google, Yelp, the Better Business Bureau, TeamDaveLogan.com, HomeAdvisor, or our website testimonials. When Will My Repair Be Scheduled? We will work with you to schedule a time that works for your needs. With several trucks and teams at our disposal, we can often accommodate lifting and leveling repairs very quickly. To ensure proper injection and atomization of the foam, however, it’s important that ambient temperatures fall within a certain range. If conditions at your repair site are likely to be too cold or too hot during the scheduled repair (e.g., in the event of inclement weather), we may need to reschedule. In addition, it’s best to avoid performing this type of repair work when excess moisture (e.g., heavy rain, flooding) is likely to be present, as it may compromise the quality of the repair. (While we do have specialty foams that work well in water, it’s a more expensive product that we don’t use as frequently.) Of course, we will let you know ASAP if the work needs to be rescheduled. Do I Need to Do Any Prep? Your Liftech representative will cover this question with you during your onsite estimate. 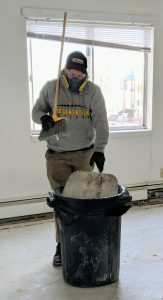 Typically, the only prep required involves clearing any furniture or other objects from the repair site or the entry to it. It’s a VERY long hose. Your lifting or leveling repair will be completed by Liftech’s fully trained and certified technicians. Every repair job is overseen by a Lead Technician who has a minimum of two years of service performing these kinds of repairs. We do not subcontract our work or use temporary employees. We take tremendous pride in the quality of our people. Liftech consists solely of W-2 employees who are offered medical and retirement benefits. All our people receive hands-on training with our owners and master technicians for a minimum of six months. 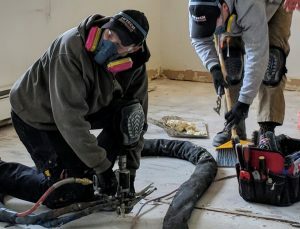 They are under apprenticeship for at least a year before they are allowed to perform concrete lifting and leveling repairs without direct supervision. How Many Technicians Will There Be? The number of technicians required will vary based on the nature of your repair. A very small lift/level job may require only one technician; on some larger jobs (e.g., complex or multi-location work), we may send out our entire team so that we can get it done within one day instead of several. The majority of our concrete lifting and leveling jobs are completed by teams of two to four professionals. What Happens When Liftech Arrives to Do the Repair? You’ll know it’s us because our name will be on the truck. Your Liftech team will arrive at your site in one of our company-branded trucks. Your technicians will need access to the repair site shortly after arrival. We will arrange with you in advance regarding how access will be granted. Post-arrival, they will first focus on ensuring proper quality control of the foam. 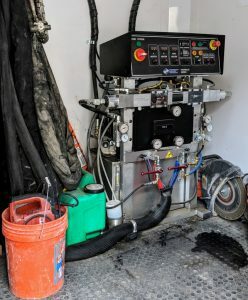 The foam must be dispensed by our equipment within specific pressure and temperature ranges, which means our technicians need to heat and pressurize it appropriately before beginning work. While this usually takes about 20 minutes, it may take longer, depending on conditions (e.g., ambient temperatures). Once they’re ready to begin, they’ll suit up in their safety gear and drag the hose inside to the repair site. 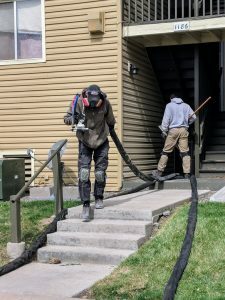 They will dispense the chemical foam directly from the Liftech truck via a very long, fabric-covered hose with a special gun on the dispensing end. We bring in only what we need to complete the repair. Aside from the hose, our drill, a container filled with ports, and a bin we’ll bring in for taking care of any trash or dust we create, everything else stays safely within the truck. This equipment moderates the poly’s pressure and temperature. We complete most concrete lifting and leveling jobs in less than a day. Depending on the size and specifics of your repair, we could be done in a matter of hours. We will let you know our time estimate for your project during your onsite estimate. What Happens If Your Equipment Has Problems? With the complexity of the technology and the precise balance of pressure and temperature required by the foam, fine-tuning and troubleshooting are a necessary component of every Liftech technician’s daily routine. Fortunately, all our technicians are fully trained on all aspects of our equipment and materials. We conduct daily maintenance and logging to make sure our industry-leading equipment is always running at its best. In the unlikely event something does break while we’re on a job, we have backup equipment ready to go. We will always complete your repair within the agreed-upon time frame. Maintain a safe distance from the work while it’s being performed. Concrete dust can be harmful if inhaled. Remain quiet as our technicians work. This work requires considerable focus and attention to detail, so it’s important that our techs be free to listen, watch, and feel for changes as they are making the injections and assessing their progress. Please do be warned, however, that our drills will be loud. What Happens If They Run into Issues? Your concrete may conceal unforeseen surprises, such as an earlier patch job hidden below the surface, hidden moisture, or countless other issues. Fortunately, Liftech technicians are adept at on-the-spot problem-solving. If they encounter any issues at the repair site, they will either find a way to work around the issue or consult with you on an appropriate solution. If appropriate, they will consult with a Liftech manager. We always do our best to find a solution that still allows us to complete the work to your satisfaction. In the unlikely event that our technicians cannot complete the lifting or leveling repair as planned, you won’t be charged. Again, no payment is due until the repair is completed to your satisfaction. Jonathan works on cleaning up the site. What Will the Repair Site Look Like After? You may be able to detect small penny-sized holes that have been filled by hand with fresh cementitious grout. These holes are the drill sites into which the polyurethane foam was injected. Our technicians do their best to return the repair site to its original condition. You can also expect that they will clean up after themselves, sweeping the area and removing any trash we’ve created (e.g., excess foam). In most situations, our repairs are permanent. Our polyurethane foam lasts indefinitely and is not susceptible to fracture or failure. It cures within minutes as a solid, impermeable structure that adheres directly to the concrete. It is a completely inert, solid material that is impervious to water, chemicals, insects, rodents, or erosion. That being said, there are many variables that may impact how long your repair will last. The earth is constantly moving, which means the soil and moisture conditions surrounding your repair may change over time. We know this is a crucially important question for customers weighing their options. Accordingly, we’ve written a blog focused solely on this topic. 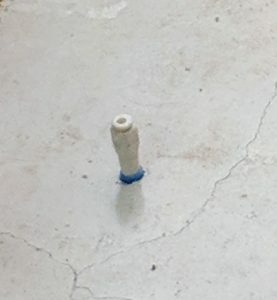 Can My Concrete Still Move After the Repair? Yes, it can and most likely will. But that doesn’t necessarily mean your repair has been compromised. Colorado has notoriously volatile soils that swell and shrink along with changing moisture levels throughout the year. Please check out our polyurethane repair FAQ to learn more. What Happens If Something Goes Wonky? Let us know. We’ll fix it. Simply call us or fill out a warranty request form and we’ll work with you to figure out a solution that makes sense for your needs. Currently, our warranty for exterior repairs (walkways, driveways, porches, patios, etc.) is two years, and our warranty for interior repairs (garage floors, basement floors, interior floors, etc.) is five years. Still have more questions about the industry-leading process Liftech uses to lift or level concrete? Let us know or request a free onsite estimate!